Apollo is a Japan-based company that manufactures drysuits, masks, fins, snorkels, boots, gloves, scooters and other scuba diving gear. For over forty years, Apollo has provided recreational, technical, commercial, military and rescue divers with high-quality dive gear that won't break the bank. Apollo are creators, not followers, with a long list of first and exclusive product engineering, plus striking looks and solid feel of products to make diving easier, safer and more comfortable. 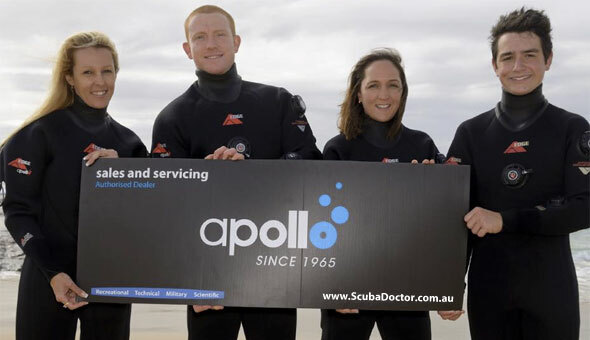 The Scuba Doctor dive shop strongly recommends Apollo products to our customers. We were Apollo Australian Dealer of the Year for 2015 and 2016, and Apollo Victorian Retailer of the Year for 2014.